A custom script header for making relatively easy to use attacks which can be launched from existing items. Also allows for easily linking attacks and ffcs if so desired. And can create special effects upon contact with enemies or objects. Designed to mimic ghost.zh behavior and syntax. Lweapons.zh is used to create lweapons independent of ffcs that can have a variety of behaviors. 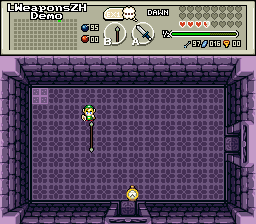 A Lweapons.zh script should begin by calling one of the functions that launches the lweapons. This can be done in an item or ffc script. Several example scripts are included as is a demo. 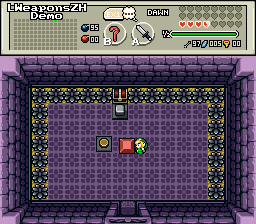 UpdateLWZH2() afterwards in your global script, you activate the automatic handling of these lweapons. the life of the lweapon, what it does on dying as well as important data for proper combo interaction. Most lweapon attributes can be altered by these functions, to create a lweapon of the size and appearance that you desire. Most of the lweapons do not have to be of their intended type and when it comes to melee lweapons; using the original type is impossible. 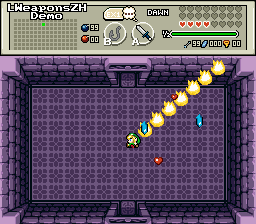 The sprites for the lweapons should have at least three tiles, in the order vertical, horizontal and diagonal. lweapon->Misc[LW_ZH_I_FLAGS]. This index is set to 15 by default, but that can be changed. Credit to Saffith for creating ghost.zh which was the basis from which this was born. 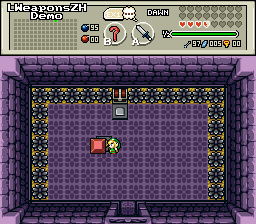 Credit to ZoriaRPG for making the item pickup array. Credit to Moosh for making the hookshot routine. 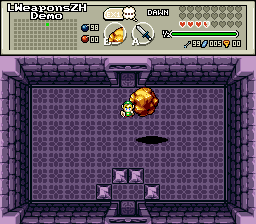 After importing the main "lweapon.zh" file, add the function "UpdateLWZH1()" before Waitdraw() in the global script and UpdateLWZH2() afterward.